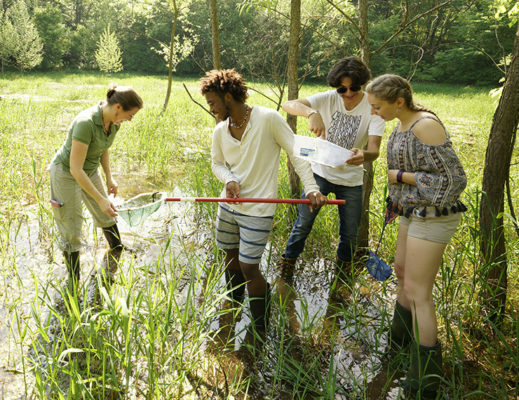 Field work is central to IB SL Environmental Systems and Societies, and you'll find students learning in knee-deep water and meadows, rain or shine. Becky Hutchins and Bob Fest teach IB SL Environmental Systems and Societies, a lab-driven, transdisciplinary course covering ecosystems, population dynamics, climate change, pollution management, and more. What are the main learning goals of the course? The main goal is for students to understand environmental issues from multiple perspectives. The course helps them to see how global politics and global supply and demand affect those issues. Students learn to develop their own opinions and critical thinking skills, and they learn that there isn’t just one right answer. How does your course encourage students to take action on environmental issues? Information is power, and we can’t change what we don’t know. I spend a lot of time helping students understand environmental issues deeply so that they care about them, feel engaged, and want to do something about them. I always want my students to feel empowered. I have my students do a project at the end of the year called Individuals Make a Difference. Students choose an issue that they learned about during the year, and they start taking steps toward getting involved in that issue. One student last year went to local restaurants and tried to convince them not to use straws, and another student got involved in a beach cleanup. What skills will students learn that they can take into college? One skill is field research. Students do two research projects during the year. The IB Group Four project is done with a group, so students learn collaborative skills. In the other research project, they do this same process on their own, and all of my students do field work. They develop a question about something in the ecosystem on campus, do research, and write a thorough report. Students go into future courses much more prepared to be independent thinkers. They learn how to do statistics for their data and how to write scientifically. What is your favorite part of the course to teach? Soil and food. Understanding how agricultural processes affect our soil. Soil erosion and soil degradation are affecting so much on our planet. Teaching climate change is also important. What other options are there at George School for learning about environmental science? We are very supported by Pacho Gutierrez’s Environmental Science: Sustainable Systems class. It’s a different focus, but I think it has really important contributions. Together we’re a team trying to make sure that we get environmental knowledge out there.